For many people, playing golf is a hobby – but that doesn’t mean you have to have a lousy game and risk injuries every time you hit the links. 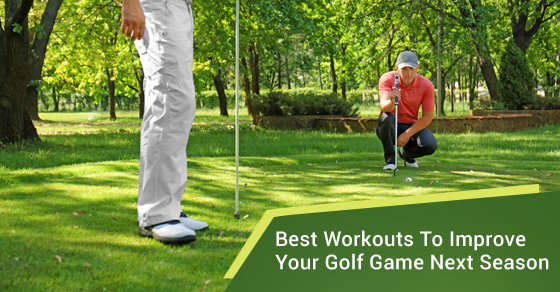 There are certain workouts you can do to stay in shape and improve your game next season. The workouts below are offer the best way to strengthen your core. Mini-Band Walks: One set of 10 steps Your glutes are what give you a stable base when you swing, and the resistance of the mini band against your legs as you stretch strengthens them. Put a mini-band around your legs above your knee. Place another one around your ankles. Walk forward using small steps while keeping your knees bent, moving your elbows back in alternating fashion as you make each step. Lat Squats: One set of six reps in each direction This exercise helps build up the lower part of your core by strengthening and stretching the glutes, groin, hamstrings, and quads – all of which are important factors needed for a powerful swing. Standing with your feet spread slightly wider than your shoulders, move your hips to the right while bending your right knee. Keep your left leg straight and ensure that your feet are flat and pointing straight ahead. Then, push your right hip to return to the starting position before repeating with the left. Knee Hugs: One set of six reps per knee Knee hugs help you in maintaining your posture throughout your swing by stretching the glutes, hamstrings, and hip flexors. To do this exercise, stand with your arms at your sides and your back straight. Then, lift your right foot while squatting down with your leg. Grab the area below your knee with your hands and pull it as close to your chest as possible while contracting your left glute for a total of two seconds. Return to the start and do the same with the other leg. The World’s Greatest Stretch (according to Golf Digest): One set of three reps in each direction This one stretch is able to lengthen every muscle in the core plus the muscles attached to it, including the hamstrings and upper back. When you do this stretch correctly you’ll be able to increase the amount you can turn while swinging. With your back straight and arms to your sides, step forward with your right foot into a lunge. Then, put your left hand on the ground and your right elbow near the inside of your right foot. Hold this position for two sections before moving your elbow back and down towards your instep. Reach through to the opposite side before placing your right hand outside your foot and repeating the movements. If you are able to complete these exercises 3-5 times weekly, you’ll notice a change in your golf game. But, if you feel any pain or discomfort while performing these exercises, stop and take a breather.